The Skil 0791 leaf blower is a handy 3-in-1 blower, vacuum and mulcher. Thanks to its 2800W motor you can quickly clear your urban garden of leaves and other garden debris. A large function switch allows you to instantly change the blower into a vacuum, and the other way around. The built-in shredder mulches garden debris, which is then collected in a sturdy 45 litre bag. 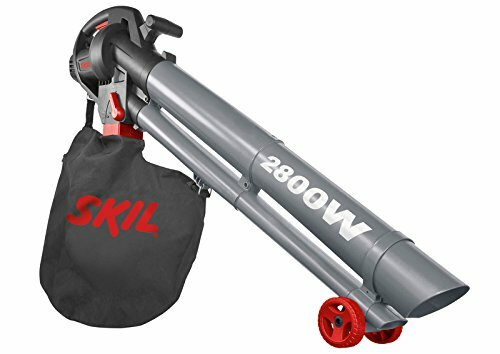 Thanks to Skil’s exclusive ‘Easy Storage’ design, the leaf blower takes up minimal storage space after use. This leaf blower has a powerful motor and effortlessly clears fallen leaves and other garden debris with a 270 km/h air flow and a vacuum volume of 13 m3 per minute. After blowing all garden debris into a tidy pile, you can use the handy vacuum function to clear up the pile. The built-in shredder of the Skil 0791 reduces the volume of the garden debris to just one-tenth, for compact and convenient disposal. There’s no need to convert this tool to change the leaf blower into a vacuum – all you need to do is flip the switch. Two ergonomic handles and the leaf blower’s support wheels ensure optimum working comfort and increase your mobility. The big 45 litre collection bag allows you to work longer without the need to frequently empty the bag. This tool is part of the ‘Urban Series’, Skil’s range of convenient, time-saving garden tools. The ‘Urban Series’ tools all feature Skil’s exclusive ‘Easy Storage’ solution, which means they are convenient to store and take up hardly any storage space after use. This garden blower is supplied with an ‘Easy Storage’ rail, making it easy to hang the tool up against the wall. Malta's Largest Online Tool & Hardware Store. Repair & Service Centre for all leading Power Tool Brands.